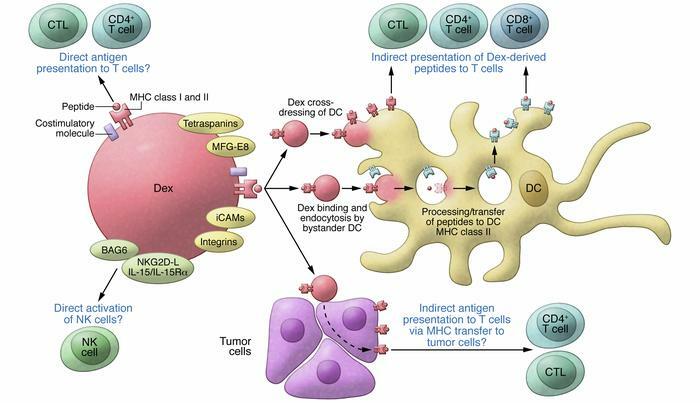 Dex interactions with immune cells. Dex may stimulate T cells by direct and indirect routes. The presence of MHC-I and MHC-II molecules on the surface of Dex gives them the potential to directly stimulate CTLs and CD4+ T cells, respectively. Dex surface costimulatory molecules aid this process. A more likely route for Dex stimulation of T cells occurs indirectly via bystander DCs through two possible mechanisms. The first involves Dex internalization and transfer of antigenic peptides to MHC molecules of the DC. These MHC/peptide complexes may then be transported to the DC surface for presentation to T cells. The second mechanism involves Dex transfer of MHC/peptide complexes directly to the DC surface, a process termed cross-dressing. It has been suggested that Dex may also transfer MHC/peptide complexes to tumor cell surfaces, enabling tumor cell targeting by host T cells. Additionally, Dex have been shown to possess BAG6, NKG2D-L, and the IL-15/IL-15Rα complex, which can each result in NK cell activation.